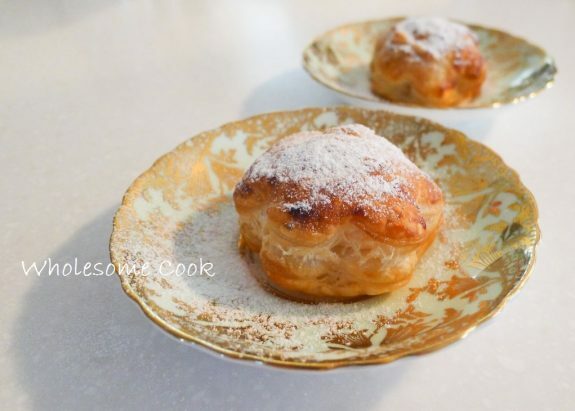 I always keep some frozen puff pastry in the freezer for the simple fact that it is so easy to use and so versatile when making all things sweet or savoury. Melting chocolate puffs included. Using a round or fluted cookie cutter (or drinking glass), cut out 12-16 pastry rounds. Make sure you have an even number of them. Place a piece of chocolate in the middle of half the rounds, then brush each round with water around the edges, cover with another round and press down to make sure the edges stick toegther. Place filled pastry on a baking sheet lined with non-stick paper and bake in the oven for about 10 minutes or until risen and golden brown. Allow to cool and dust with icing sugar before serving. These look absolutely delightful. I’d love to chow down on a big plate of them!